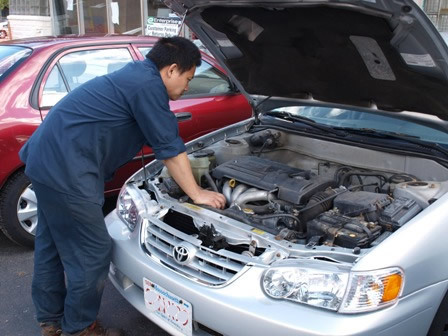 Cox Auto has all the typical must haves in a mechanic including: fast service, honesty, and reliable prices. BUT, the real reason I keep coming back is for their quirkiness. I love it, makes the "oh god my car died" pains disappear into laughter. -They tend to answer the phone in Chinese. Or just "Hello?" You usually have to ask twice whether this is Cox Auto. It makes me feel like I'm in a secret society. -When they leave you a message, it usually goes something like "This is mumblemumble from Coxauto (said as one word). Call me." No number. Cracks me up every time. - When I ask what was wrong with my car, it usually goes like this : "Your mrmrmotor was bad. We fixed." Me: "My roter? Which one?" Them: "Uh, huh. Your mrmrmrotor" Me:"Oh, my motor?" Them:"Yes, motor. We fixed." Me: "Oh...Thanks?" Thanks Cox Auto for fixing my car and making me feel (self imposed) like a Stupid American every time!